EPEES applications for the enrollment in October 2019 and April 2020 are currently being invited. • hold a Bachelor’s degree in any field. • hold a Master’s degree in any field. Several applicants may qualify for Pre-arrival Admission, which enables them to take entrance examinations in their own countries by using the equipment like the Polycom or Skype system if it is settled in their universities. If it is difficult to take the interview by using the equipment, there are some cases we cannot accept their applications. To apply for Pre-arrival Admission, submit the documents listed below for screening by May 10, 2019 by email (our office will be closed between April 27 to May 7 due to National holidays). If interested, contact the Academic Affairs Office of our graduate school before proceeding for further information. 1. Admission Application form with ID photo (The designated form must be used, and will be provided upon request. The photo should be taken on February 10, 2019 or later, 4 x 3 cm, upper body, facing forward with no headwear). 8. Applicants should submit a copy of TOEFL, TOEIC or IELTS score sheet obtained within the last two years with the application. Applicants selected as candidates for Pre-arrival Examination based on document screening will be notified by the beginning of July 2019 and should send all additional forms for the entrance examination. These forms must be submitted with the examination fee (JPY 30,000) by July 19, 2019 after receiving the notification. * See the Graduate School website for details of the regular entrance examination. Entrance examinations and Pre-arrival Examination interviews will be held by using the equipment like Polycom or Skype system if it is settled in your university by August 23, 2019. Information on exact dates, times and locations will be provided after screening. Interviewees will be asked about their Bachelor’s or Master’s thesis and future plans for study on the Master’s or Doctoral courses, respectively. 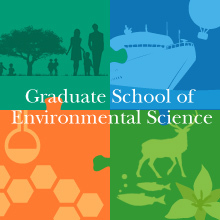 Applicants not qualifying for Pre-arrival Examination can take the regular entrance examination for the Global Environmental Management Course at the Division of Environmental Science Development. Applications must be submitted by July 19, 2019. The final successful candidates will be announced on September 3, 2019. EPEES program does not offer a scholarship for the students. A few students may get the Monbukagakusho Scholarship for Privately Financed International Students; a monthly amount of JPY 48,000 for six months or one year after their arrival in Japan. • EPEES is a Graduate School of Environmental Science English program with Master’s and Doctoral courses. • The program is intended to foster the development of professionals and researchers who can contribute to solve international environmental problems with extensive knowledge and global perspectives. • The program is conducted entirely in English. • Students are required to pursue a main research topic and study a sub-research topic as a mini-project. • The program is run by the Division of Environmental Science Development in conjunction with three other Graduate School divisions. • Pre-arrival Admission * may be offered on the program. * See the information on Pre-arrival Admission and scholarships. Globalization has caused various environmental issues around the world that often transcend borders. In order to solve these problems, to conserve the earth’s precious environment for future generations and to build up a sustainable society, this program is intended to foster the development of professionals and researchers who can contribute to the protection of global and local environments based on extensive knowledge, global perspectives and the ability to act practically using their expertise. Graduates are expected to understand different cultures, customs and values, and to be able to cope with environmental problems in collaboration with researchers and experts from various countries. The program involves practical education in English through classes, work and seminars with the aim of seeking ways to maintain and enhance the sustainability of the earth’s system. Students adopt a main theme for their Master’s or Doctoral thesis under a supervisor, and simultaneously study a sub-research topic from a different field within a study group. This approach fosters the ability to judge international environmental problems appropriately on the basis of interdisciplinary focus. Students perform two or three years of special research under a supervisor on a main topic chosen from the fields of study listed below, and also investigate a sub-research topic as a mini-project in the course seminar. The sub-research topic should be in a field different from that of the main topic. In order to complete the course and obtain a Master in Environmental Science (EPEES) degree, students must earn 30 credits or more from the categories listed below. Students may choose from the advanced subjects, common subjects and laboratory and fieldwork areas listed below. • have at least one paper published from an international peer-reviewed scientific journal. Applicants for the Spring Entrance Examination in February 2020 (Master’s and Doctoral Courses of the Division of Environmental Science Development, and Master’s Course of the Division of Earth System Science) must submit TOEFL, TOEIC, or IELTS score sheet. We will not give an English examination on-site. To submit your score sheet when you apply, you must take one of the examinations early enough. The details will be provided in the Guidelines for Applicants which will be issued in April 2019. Here are the results of feedback surveys about the courses conducted in the 2017 academic year. There was an error in examination papers on specialized subjects of Atmosphere-Ocean and Climate Dynamics Course (Division of Earth System Science) at the entrance examination held on Thursday, August 23th, 2018. We apologize to everyone who took the examination and will further strengthen the checking system of exam questions to prevent recurrence. Please view the following PDF for details.